Now available as a PDF and soon in print! This book tells the story of the many corporations which exist in Clement Sector. It tells how they came to be, how powerful they are now, and how your players might interact with those corporations. From the time of the first colonists in Clement Sector in the 2200s until the time of the present of 2342. First, we’ll tell the story of the most powerful corporations in Clement Sector and of the people who made those corporations powerful. Some, like James Lancaster, are no longer around but his influence is still felt by not only the players but also by the other corporations that survive. Then we will touch base with 40 other smaller corporations that your players may encounter in Clement Sector. These corporations, though their presence in Clement Sector is not as large as those covered in the previous section, may affect your characters in their day to day life. Third, we present some information on how corporations in Clement Sector work and how a corporation can be set up in the first place. This can be powerful information for your characters as they may seek to create their own corporation. Next, we give you two careers for new characters to allow them access to the corporate world. We’ve already given you a corporate shipping career in Diverse Roles and here we expand on that with a corporate courier career and a corporate fleet career. 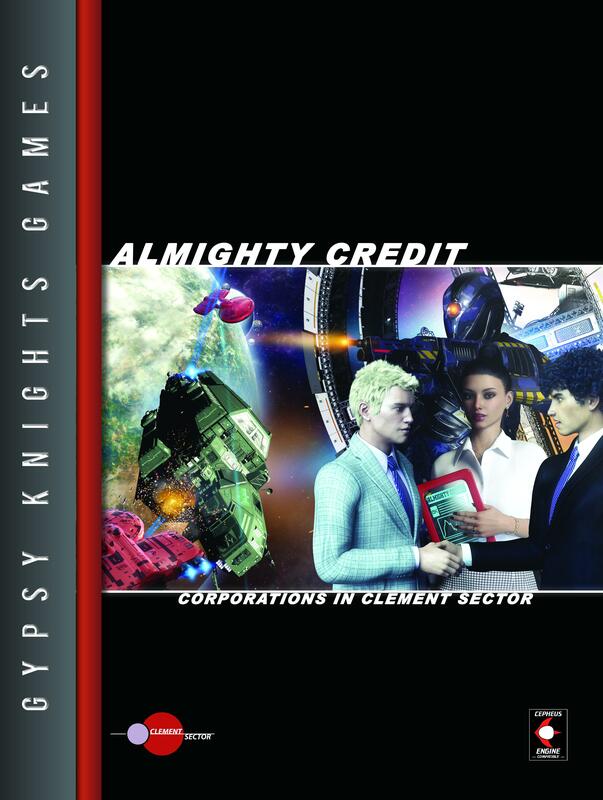 Lastly, we give you The Almighty Credit, a minigame which allows you to take on the role of one of the corporate heads in Clement Sector. Using these rules, players will compete against one another as the bosses of these corporations. If you so desire, you can combine these rules with those presented in Balancing Act to allow the corporations to fight with and alongside the governments of Clement Sector. Of course, you may not be using the Clement Sector setting. For you, the backgrounds may have to be tweaked a bit, but I think you should be able to import these corporations and histories into most any science fiction setting. The rules presented in The Almighty Credit minigame could certainly be used with any setting. Just a quick note to say that the print version is now available at DTRPG as well as the PDF version.